Impara l'italiano divertendoti a Rodi Garganico, un bellissimo borgo della Puglia Settentrionale, in Italia! Potrai ammirare e conoscere bellissimi borghi in cui il tempo sembra essersi fermato, riserve e aree marine protette, la Foresta Umbra, una secolare foresta di alberi di faggio, la terra di Bari con i suoi castelli e le sue cattedrali, pura espressione del romanico pugliese e proseguire magari per visitare il resto della Puglia. Come to learn Italian language enjoying in Rodi Garganico, a beautiful Northern village of Apulia, a region of the South - Est Italy on the Adriatic sea. The village is in the green heart of the Gargano National Park. You can combine the study with the holiday in an inusual place for learning Italian language. 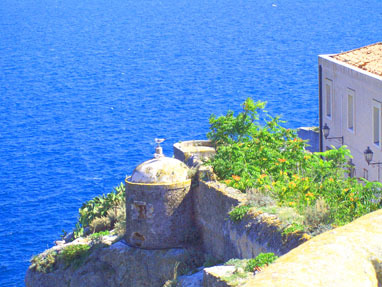 In 2011 the Gargano's coast was suggested by the Guardian among the 10 most beautiful places in the world. Here the Bollywood producers are turning the new Indian movies successes. You can admire and learn about beautiful villages where time seems to stand still, reserves and marine protected areas, the Umbra Forest, a forest of old beech trees next the sea, the land of Bari with its castles and cathedrals, pure expression of Romanesque Art and, if you like, visit Tremiti Islands, the only archipelago in the Adriatic sea from the new port of Rodi Garganico.